I have an Apple TV which works perfectly. On my iPhone 6s I've been using the Apple TV Remote app for quite some time and that too works perfectly. A week ago I activated the Apple TV Remote option for the Control Center (in Settings > Control Centre > Customise Controls) and for the past week I've been trying to get it to work, but for some unknown reason it never ever finds my Apple TV. It just keeps searching and searching! How do I get this to work? It would be fantastic to use this from the Control Center! My guess is that you’re using either a 2nd or 3rd generation Apple TV. The iTunes Remote and Apple TV Remote apps available from the iOS App Store will work with all Apple TV units going back to the Apple TV 2. However, the Apple TV Remote option you can configure as a control in Control Centre will currently only work with the Apple TV 4 and Apple TV 4K units. Unfortunately, Apple hasn’t made this obvious in the user interface and as a result no error or info message is shown to let the user know. Not the answer you're looking for? 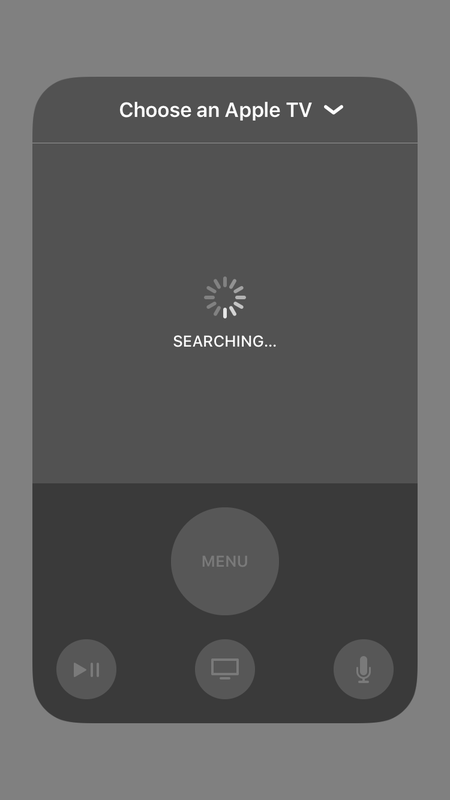 Browse other questions tagged ios appletv remote-control control-center . How do I set my Logitech harmony remote to control my Apple TV?